More an interactive fairytale than a game, this Sims spinoff tells a good yarn but feels limited. Once upon a time, there was a game called The Sims Medieval. Set in a picturesque fantasy kingdom of kings, knights and wizards, Medieval told many a charming and off-the-wall humorous tale of its people and their lives. It's just that there wasn't much game to it. It's both a strength and a failing that Medieval isn't a lazy re-skinning of The Sims 3. It's driven by one of the least challenging parts of Sims 3: quests, which usher your chosen “hero” Sims—including a spy, a blacksmith, a priest and seven others—through a series of brain-dead simple objectives. The new context works, but I don't like that it excludes so much of The Sims' standard sandbox gameplay, like free construction and raising new generations of Sims. 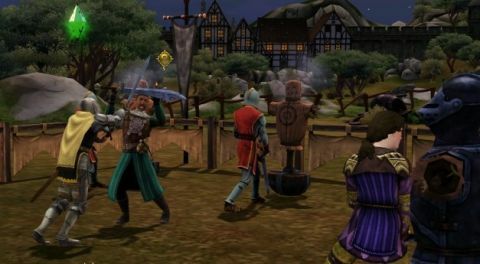 Medieval's quests are a chain of tasks, like “Challenge Sim X to a duel.” To solve this, you click the icon that appears over the target Sim's head and select “Challenge to duel” from the menu. They duel, and it gives you another task: “Tell the Monarch you won,” which you solve in exactly the same way as the duel task. A trained monkey could play 90 percent of this, and it only gets slightly trickier when you're given two Sims to manage at once. It didn't take me long to figure out how to easily max out my Sim's performance meter nearly every time. All I had to do to get my Sim “focused” was do a couple of compulsory profession-related tasks per day—in the case of my doctor, it was treating a couple of Sims for illness by collecting and applying blood-sucking leeches in a super-basic minigame and crafting medicine from gathered herbs—and then satisfy his most basic needs by buying him a comfy bed and strolling into the off-map village market to buy some pigeon meat for soup. He doesn't even need to bathe or pee—using the chamber pot is entirely voluntary. A few tasks are jarringly more complex, such as when your Monarch Sim has to pass an edict—I still don't completely understand this process, but it's got a lot to do with bribery. It ends up as more of an interactive choose-your-own-adventure than a game, and that's where Medieval's treasure lies. Stories are often light and goofy, with typical E-rated Sims fare; at others, they're full of delightfully dark humor, with summary executions, dire chinchillas, assassinations and organ theft. Once I got some momentum built up, Medieval did get me happily clicking ahead to see what would happen next, and the stories branch out enough that I'm curious to see what the wizard would've done had I chosen him to solve the “Talking Frog” quest rather than the doctor. While there may be tons of achievements to earn, without the freedom to build and live as you please, Medieval doesn't have the same lasting appeal as its parent game.